David T. Daly, chief executive officer of PRIDEStar EMS, is bringing a satellite ambulance base of his company to the former Easter Seals location, 135 Route 27 in Raymond. Daly said the company purchased the 10,000-square-foot building on 1 acre, directly across from Lamprey Health Care. Daly said PRIDEStar EMS (Emergency Medical Services) had been looking for a location along the Route 101 corridor for some time. He found Raymond to be an ideal site to serve the company's current contracted facilities in Portsmouth and Manchester, while also being a base from which to market services in the region, where it sees areas for growth. Daly said Raymond will complement and expand the company's existing service area. Daly said Raymond was selected after the Town and the community showed the company its interest in having the company. “The Town officials have been second to none, and I see Raymond as a growing community that needs the exceptional medical transportation services that we provide,” he said. “We are bringing first-class service- to a first-class community. My personal commitment to the Raymond area is the same commitment PRIDEStar EMS has for all the communities we serve. I take great pride in being an integral part of the community." Daly added, "We invest heavily in both our employees and the communities we serve. Raymond will be no different." Thanks to its recently purchased building, Daly said, “We have acquired some long-term tenants (Excel Physical Therapy) who are currently in the building who we would love to see stay with us. PRIDEStar EMS intends to utilize about 2,500 to 3,500 square feet of the building and lease out the remaining space to businesses interested in moving to the area. My company also purchased 31 acres of adjacent land, which we intend to develop to accommodate further PRIDEStar EMS expansion or other commercial development. We feel whichever direction we choose to go will benefit the community. I think town residents, businesses and officials will feel an immediate impact from having PRIDEStar EMS as their neighbor." The company plan calls for PRIDEStar EMS, as an inter-facility medical transportation company, to provide mutual aid to the community as needed. PRIDEStar EMS does not intend to compete with Raymond 911 for emergency calls but instead would provide an additional resource if needed. PRIDEStar EMS does not respond to calls unless the company is specifically called to do so, either by a client or by a town service, perhaps in the event of a major incident. "Currently, our plan is to staff one truck with an EMT-Paramedic and an EMT-Basic for 12 hours per day," said Tony Palmisano, vice president of Business Development. An EMT is an emergency medical technician. "We also plan to have one of our chair van units be staffed out of Raymond,” Palmisano said. “As we get settled, we will add additional resources to the location. PRIDEStar EMS can be reached 24 hours a day, seven days a week at 218-0911. "We are excited to be part of the Raymond community," Palmisano said. "As the other communities we serve will attest, we are hands on and like to know our new neighbors. We support many charitable endeavors in the region. In addition we are committed to helping our nation’s veterans. We volunteer and raise money to help veterans’ causes, and we hire qualified veterans. From the senior team and management down to our employees, we are known to serve on local boards and through other interactive endeavors. We have a strong commitment of giving back. It’s our position that being charitable to our neighbors is an obligation and responsibility, not a choice." PRIDEStar EMS opened in 2006. Headquartered in Lowell, Mass., it includes 170 employees and more than 60 vehicles. Services include advanced life support, basic life support, chair van and medical livery services. For more information, visit: www.PRIDEStar ems.com/index.html. David T. Daly, CEO of PRIDEStar EMS, announced today the company’s intention to open a satellite ambulance base in Raymond, NH. This new base will be located at the former Easter Seals location, 135 Route 27 Raymond, NH. 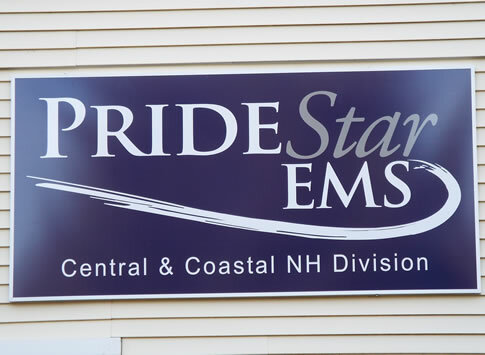 PRIDEStar EMS - which began operations in 2006 – is the premiere medical transportation company in the Merrimack Valley and Southern New Hampshire. Our services include ALS, BLS, Chair Van, and medical livery services. PRIDEStar’s headquarters are located in Lowell, MA. PRIDEStar’s current operation includes 170 employees and over 60 vehicles.